At only 11 months of age "Jake" became the first Canadian-bred Toy Manchester Terrier to win the American Manchester Terrier Club’s National Specialty!!! 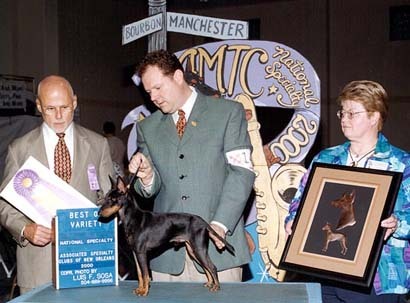 Beginning with a Best of Breed win over the largest entry of Toy/Standard Manchester Terriers in history, "Jake" remained undefeated throughout the National weekend, with Best of Breed at both accompanying District Specialties/All-Breed shows as well as both a Group 4th and a Group 2nd. In addition "Jake" was also awarded top honours in the AMTC Puppy Sweeps competition. He is now the #1 Toy Manchester Terrier in the U.S. for breed points (Source: Canine Chronicle).